Learn about urban water services, focusing on conventional technologies for drinking water treatment. This course focuses on conventional technologies for drinking water treatment. Unit processes, involved in the treatment chain, are discussed as well as the physical, chemical and biological processes involved. The emphasis is on the effect of treatment on water quality and the dimensions of the unit processes in the treatment chain. After the course one should be able to recognise the process units, describe their function, and make basic calculations for a preliminary design of a drinking water treatment plant. This course has been awarded with the Award for Open Education Excellence in 2014 and has been shortlisted for the Wharton Awards for having the first online laboratory for experiments in Drinking Water Treatment in 2014. 1. Introduction to Drinking Water Treatment. In this module you learn to describe the important disciplines, schemes and evaluation criteria involved in the design phase. 2.Water quality. In this module you learn to identify the drinking water quality parameters to be improved and explain what treatment train or scheme is needed. 3.Groundwater treatment. In this module you learn to calculate the dimensions of the groundwater treatment processes and draw groundwater treatment schemes. 4.Surface water treatment. In this module you learn to calculate the dimensions of the surface water treatment processes and draw surface water treatment schemes. At first this course was given as part of Introduction to water treatment. This year we offer two separate courses: “Introduction to drinking water treatment” and “Introduction to the Treatment of Urban Sewage”. Together with the course “Introduction to Water and Climate” they form the Water XSeries Faculty of Civil Engineering and Geosciences, TU Delft. 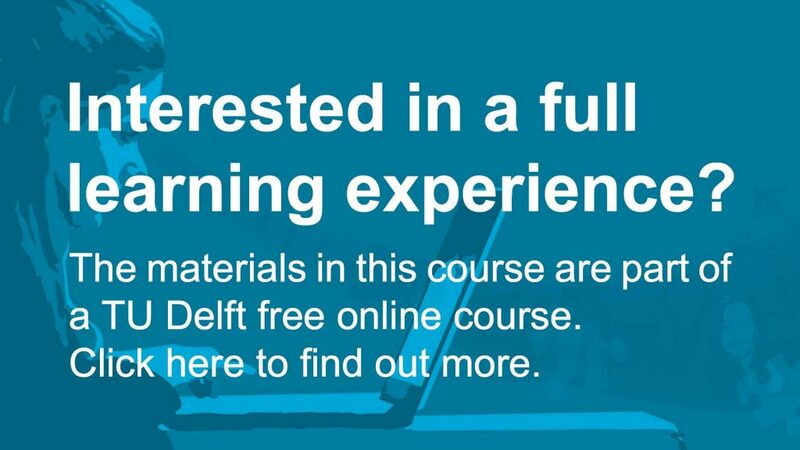 Introduction to Drinking Water Treatment by TU Delft OpenCourseWare is licensed under a Creative Commons Attribution-NonCommercial-ShareAlike 4.0 International License. Based on a work at https://ocw.tudelft.nl/courses/introduction-to-drinking-water-treatment/.